I never realized how versatile Oreo cookies could be. Not only are they a great treat plain, but they hold up well when dunked in a tall glass of milk OR baked into a cupcake. I’d like to hug the Oreo inventor one day as a way to thank him (or her). Life would not be the same without these cookies. What’s even greater is the variety of flavor and colors. While the original Oreos are still a favorite, I’d guess the peanut butter flavor is a close second. I do love peanut butter! 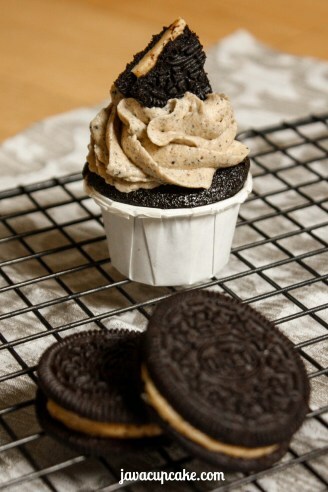 Java Cupcake managed to include peanut butter Oreos in the cupcake AND in the frosting. Oh my. Oh, and this recipe is for mini cupcake, you know, for less guilt. Preheat oven to 350 F degrees. Line cupcake pans with mini cupcake liners. In a medium sauce pan, melt the butter. Add the coffee, espresso powder, cocoa powder, and vanilla and whisk until combined. Set aside to cool slightly. In a large bowl, sift together the sugar, flour, baking soda and salt. Set aside. In a medium bowl, whisk together the sour cream and the eggs. SLOWLY add a few tablespoons of the chocolate mixture to the sour cream mixture. Whisk to combine. In a slow stream, whisk in the remaining chocolate mixture until combined completely. Make a well in the center of the flour mixture and pour in wet. Using a whisk, stir until no more lumps remain. Fold in the crushed Peanut Butter OREO sandwich cookies. Scoop batter into baking cups 2/3 full. Bake 17-19 minutes. Allow to cool in pans before removing to a wire rack to cool completely before frosting. In the bowl of your stand mixer, cream together the peanut butter and butter for 2 minutes. Scrape the sides of the bowl several times. Add the powdered sugar and mix on medium until combined. Add the salt and heavy cream, mix until smooth. Beat on high for 1-2 minutes or until fluffy and the color has lightened. Using a Wilton 1M tip on a disposable bag, pipe mini swirls of frosting onto each cupcake. Top with a piece of Peanut Butter OREO cookie. I used Wilton Nut & Party Cups instead of mini cupcake liners. The package says “not intended for baking” but I have had no issues baking with them. You could use regular mini liners instead of these cups, but you’ll use less batter and this recipe will yield more cupcakes.